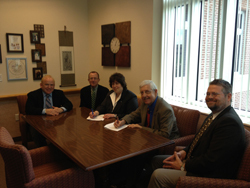 (l to r) Touro Law alum Bruce K. Gould '84, Touro Law Assistant Dean for Admissions George Justice, Touro Law Dean Patricia Salkin, Dean of UCF’s College of Health & Public Affairs Michael Frumkin, and UCF Legal Studies Chair James Beckman sign the 3+3 program agreement between Touro Law Center and UCF. Touro Law Center and the University of Central Florida (UCF) are pleased to announce the creation of a three-plus-three accelerated law program. This newly established academic program will offer significant advantages to interested, qualifying students. The program will provide the opportunity to qualified UCF students to seamlessly complete a UCF Legal Studies B.A. or B.S. and a Touro Law Center J.D. degree in six rather than seven years. The three-plus-three program, once formally approved by the university, will be available to students entering UCF as of the Fall 2014 class. Admission to the program will be determined by personnel at both UCF and Touro Law. Participants in the program will complete the first three years of study at UCF and the fourth year in residence at Touro Law Center as part of the first year of law school. “This is an exciting opportunity for UCF and Touro Law. Many of our undergraduate students want to pursue a law degree. This gives them an opportunity to earn their degree from UCF in a concentrated three years and then enter a great New York law school to continue their legal education and training,” said Michael Frumkin, Dean of UCF’s College of Health & Public Affairs. Students interested in the program should contact the UCF admissions office at (407) 823-3000 or by email at admission@ucf.edu. The University of Central Florida is a metropolitan research university that ranks as the 2nd largest in the nation with nearly 60,000 students. UCF's first classes were offered in 1968. The university offers impressive academic and research environments that power the region's economic development. UCF's culture of opportunity is driven by its diversity, Orlando environment, history of entrepreneurship and its youth, relevance and energy. For more information visit www.ucf.edu. Touro is a system of non-profit institutions of higher and professional education. Touro College was chartered in 1970 primarily to enrich the Jewish heritage, and to serve the larger American and global community. Approximately 19,000 students are currently enrolled in its various schools and divisions. Touro College has branch campuses, locations and instructional sites in the New York area, as well as branch campuses and programs in Berlin, Jerusalem, Moscow, Paris and Florida. New York Medical College, Touro University California and its Nevada branch campus, as well as Touro University Worldwide and its Touro College Los Angeles division are separately accredited institutions within the Touro College and University System. For further information on Touro College, please go to: http://www.touro.edu/media/.